A strong leader can bring out the greatness in those around them, change a community for the better, and help others see the possibilities of the future. At Partnership With Native Americans (PWNA), we believe that developing the abilities of emerging leaders who want to make a greater impact on the reservations is an integral part of building strong, self-sufficient Native American communities. 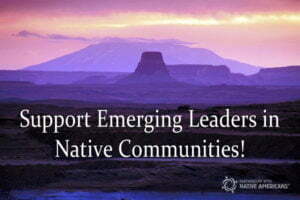 Our 4 Directions Development Program (4D) helps develop grassroots leaders throughout the Native communities PWNA serves. These emerging leaders have the opportunity to take part in a six-month training program that includes personal and professional development, setting of self-identified goals, and working work with an advisor-mentor, PWNA staff and other resources to reach those goals. Skill-building such as networking and public speaking can translate into the ability to organize their community or mobilize workgroups, effectively communicate needed information, and more confidently collaborate with and lead those around them. The participants who graduate from the 4D program are better equipped to empower others within their communities, pave the way for locally-driven change and help the tribes into the future they want. This fall PWNA will launch its first all-women cohort, known as 4D Strong Native Women. The program is supported by PepsiCo Foundation grants for girls and women, which aim at helping 1.5 million women be successful in the workplace and benefiting 12.5 million women around the world. In addition to providing funding for the Strong Native Women cohort, members of the Native American employee resource workgroup known as PepsiCo RISE will volunteer as mentor-advisors for the 4D participants (along with continuing to mentor many of our AIEF scholarship students). PepsiCo employees who are members of RISE share an interest in Native American culture, history and current issues. The 4D Strong Native American Women cohort will begin October 2018 and conclude in March 2019. Recruitment for participants will begin soon for the program, which will take place in Santa Fe, New Mexico. This entry was posted in Humanitarian, Programs and tagged 4 Directions Development Program, 4D, community leaders, leadership, Native American leaders, training, women leaders. Bookmark the permalink. Trackbacks are closed, but you can post a comment.